Your party will be over the top with this Ultimate Halloween Party Set! Service for 16 guests! This party pack includes Dinner Plates, Dessert Plates, Napkins and Cups. 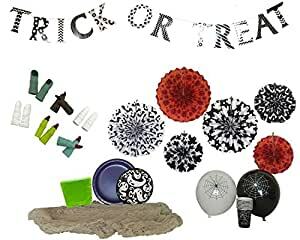 Decorations include Balloons, Creepy Gauze Cloth for a table runner or other decor, hanging paper fans, Word Banner and Monster Fingers that make a spooky decoration or party favor. Easy setup and clean up for the host and hostess. Perfect for a child, teen or adult party.